Everyone has senses. And most people have sensory issues of some kind, to some degree. Here is your mini primer on sensory processing: you already know about sight, hearing, taste, smell, and touch. But we have many more senses than those, including our senses of pain, temperature, vibration, balance (sometimes called vestibular sense), and proprioception – which includes the ability to sense your own movements, the position of your body parts, the sort of sense of being in your body that many people take for granted. Introverts are more likely to be sensitive than extroverts in many ways – not just emotionally, but in the ways they perceive the world. Some people have sensory processing disorders (not an official diagnosis in the DSM but these would be sensory issues that are more intense than just being “sensitive”) who are not on the autism spectrum. Autistic people have sensory issues (though this is not the only thing that points to a person being autistic, it’s a significant one) that differ in degree from the neurotypical population, and sometimes in kind (that is to say, some senses may be heightened, some under responsive, and some are just different). When I first went to see my psychologist to find out whether it would be worth evaluating me for autism, she asked me whether I could remember times during my childhood when I struggled with or withdrew from certain activities or environments due to sensory issues. I was startled by how difficult it was for me to answer this question. I’ve always considered myself an introspective and fairly self aware person (after all I have a dozen hand written journals from my adolescent years) but this was not something I had ever been tuned into. What I knew was then I had always found myself tipping over into what I simply called “a bad mood” for reasons that I could not explain at all. The only way I could explain this to myself was that I must simply be “a moody person.” Maybe it was because Cancer is my astrological sign – I couldn’t think of any other explanation. I never liked this about myself but there seemed to be so little I could do to change it. It’s not that I was depressed or bipolar, I was just irritable, frequently, at unpredictable (to me) times. Over the years I’ve found myself apologizing and frustrated that I could not tell a loved one why I was being so unpleasant – there was nothing really wrong that I could think of – nor could I seem to snap out of it. I was pretty self aware as a person, but I couldn’t be fully self aware as an autistic person, because not only did I not know I was autistic, I did not even know that something called “sensory processing” existed. Then I had a child, and when my child was a toddler I would reach out for help with this parenting issue or that, and more than one person suggested that I look into whether he might have sensory processing disorder. The funny thing was, I read website and website and even a book or two, and there was the time we brought him for an OT evaluation, and I would comb through these lists of sensory processing issues and I just kept thinking, actually that sounds more like ME than him. Huh. 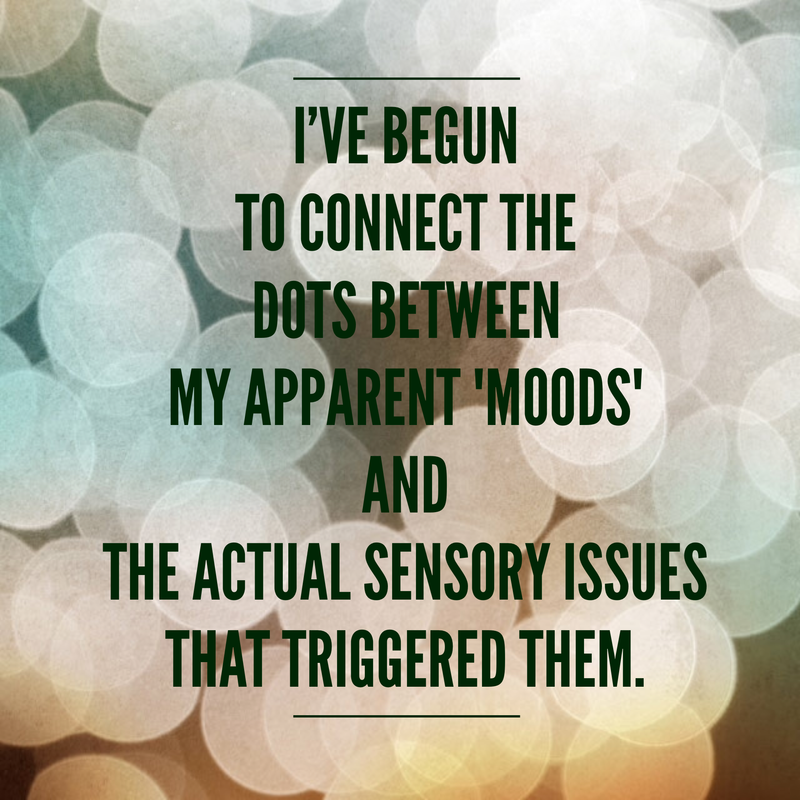 I’ve only veeeerrrry slowly, over many many months, begun to connect the dots between my apparent “moods,” and the actual sensory issues that triggered them. For half my life I was terribly disconnected from my sensory needs and aversions and was just kind of barreling through life ignoring them or giving them only cursory attention, much to my detriment. This actually is an incredibly common phenomenon, even after an autistic person realizes they are autistic and have special sensory needs. Because autistic people usually also have executive functioning difficulties (I promised before I’d write specifically about executive functioning, and I will, sometime), it can take us longer than a neurotypical person to register sensory information or discomfort. It’s common to not realize that you are hungry, cold, in pain, etc. until you are on the verge of a meltdown and finally focus on what it is that has been bothering you beneath the surface. * Seams. One of the things that is always on those lists of sensory issues is “bothered by seams in clothing.” I would always see that and think, no, seams don’t hurt or scratch me. As long as they are always perfectly lined up and symmetrical on my body and not bunched up or — ohhhhh. * Light touch: wind blows. I’ve always hated the wind. The way it feels on my skin, the way it ripples my clothes, yeeeuchh. In high school I wore my hair long, and when the wind would whip my hair into my eyes and my mouth or even when it just blew over my head and messed up the part in my hair, I would find myself falling into a helpless rage. Over wind. This is one of the lesser known reasons why I now wear my hair short! * Light touch: not OCD. Also sometimes when something, say, grazes my arm just slightly, I will feel a revolting sensation in that spot for a long time afterward, but I can sometimes fix it by grazing the other arm in the same place purposely. I still feel it but the symmetrical feeling makes it less irksome. This is the sort of thing that some people incorrectly dub “OCD.” It’s not OCD, it’s a sensory issue. * Noisy. My most intense, and most challenging, sensory issue is auditory processing. It’s still hard to explain exactly how it works for me, but I guess one way to describe it is that my auditory channel takes in a LOT of information and frequently floods me with way too much. It’s sort of a fluid and ever-changing sense that I seem to be able to control very little. (An autistic friend recently told me that she can kind of “shut off” her auditory input in noisy environments, which made me feel very envious!) Sometimes I am not aware that I am overloaded by sounds until I begin to melt down (for me this looks like getting angry and bitchy – one of my “bad moods”). Sometimes I am hyperaware of sounds and it’s like a scene in a movie where the protagonist is freaking out and the audio is all loud and chaotic. Sometimes I begin to involuntarily shut down auditory input and cannot focus on what people are saying to me – sort of like when you are driving while tired and keep zoning out so you don’t remember how you got to where you are, even though you are trying to pay attention – but with listening skills. I hate white noise, like ceiling fans. I hate repetitive noises that are not perfectly synched – so a sink dripping or a person snoring is horrid, while a ticking clock is probably okay. I love loud music but music that’s just barely audible drives me bananas. * Am I in my body? One of the weirdest, but also to me one of the coolest, sensory issues I experience is off kilter proprioception. M. Kelter writes beautifully about his proprioceptive issues (and other things – I love his writing) and he also happens to love touching walls, like me – whenever I walk down the narrow hallway in my house I run the backs of my fingertips along the wall. But enough about walls. Proprioception is somewhat hard to explain but it’s the sense of being in your body, one with your body, feeling all of your parts, feeling your own weight and mass. It’s probably quite difficult to imagine if you don’t ever have atypical proprioception. I can remember at least as early as my teen years, and this still happens, that I would suddenly get this uncanny feeling of looking out of my own face. I would become too aware of my own nose, and then feel like I was looking down at my body doing things, but not feel totally one hundred percent integrated with that body, very much a kid’s cartoon in which a little person is sitting inside of a robot’s head operating a walking, talking robot. But who was this “me” who was looking out of this body, and why was I in this body? It’s an unsettling mindset that I don’t like to linger in for too long, but it’s also kind of oddly pleasurable and comforting too, possibly because I have always had these experiences and they are, though strange, familiar. It’s only recently that I have realized this is related to the proprioceptive sense and the way an autistic mind can become sort of disconnected (I think Kelter uses the word “floating” a lot) from the body. * Squinting. I am a little sensitive to light, always have to wear sunglasses outside, don’t like fluorescent lights. I really dislike contrasty lighting, so a dim space with bright spotlights makes me feel very yucky. Often when I am drawing I squint in order to screen out excess information and see just the overall composition of my work. But my sight is mostly a sense that gives me pleasure. * Bitter Betty. I like foods with strong flavors, especially bitter flavors. Probably why I love coffee with no sweetener, and the hoppier the better when it comes to beer. I also like spicy stuff and salty stuff. I like complex foods that have a lot of flavors going on. Lots of people with sensory issues have the opposite preferences for very bland foods. They are not just being picky but are quite overwhelmed by food flavors (or textures). * Air “fresheners.” I think I have a pretty sensitive sense of smell, but mostly smells don’t bother me much. Even body odor, which most people find offensive, is a fairly neutral odor to me. The smells that bother me the most are industrial-chemical smells and artificial scents, like new carpeting, rubber tires, etc. The worst are those plug-in air fresheners – when I used to be an interior painter, I couldn’t work in a house that had one plugged in. When someone comes from a house that has a lot of air freshener, I can smell it on their clothes for hours. Those types of scents give me a headache and make me feel ill. I’d rather just smell your ordinary house smells! * That time of the month. All of my sensory issues are more intense when I have PMS. That’s quite common with autistic women. The thing I notice the most is my tactile senses – being touched, how my clothes feel – are the most bothersome during that time of the month. Very annoying when you are already feeling cranky and hormonal! I’m still in the stage of identifying my own sensory issues, almost like uncovering repressed memories, except that they are not memories of things past, but repressed feelings that I presently feel. If you have sensory issues, whether they are part of something like sensory processing disorder or autism or just being a sensitive person, I think it’s okay to be up front with them. I admit that I didn’t always feel this way and used to think that people should just “get over it,” probably because I was so used to doing the same and wouldn’t allow myself to voice my preferences. What are your preferences, what kinds of sensory inputs do you abhor and which do you love? Drop me a comment, I’d love to know!